A week after the British GP the Formula 1 circus was back together again in Holland and there were clear signs that the Honda F1 program was beginning to become more serious as Ritchie Ginther took pole position ahead of Jim Clark's Lotus and the BRM of Graham Hill. 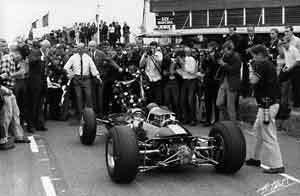 Dan Gurney's Brabham shared the second row with John Surtees's Ferrari while the third row featured Mike Spence in the second Lotus, Denny Hulme in the Brabham (standing in for Jack Brabham again) and Jackie Stewart in the second BRM. At the start of the race Ginther took the lead with Hill second and Clark third. It took Hill until the end of lap two to slipstream past the Honda and then Clark followed at the end of the fourth lap and then managed to get Hill in the course of lap five to take the lead. As Clark pulled away from Hill Ginther dropped back and was overtaken by Gurney, Stewart and then Hulme in the laps which followed. Hill was unable to challenge Clark and he began to drift back down the order in the mid-race with Gurney and then Stewart passing him. Stewart was then able to overtake Gurney and move to second place but there was no way he could catch Clark.